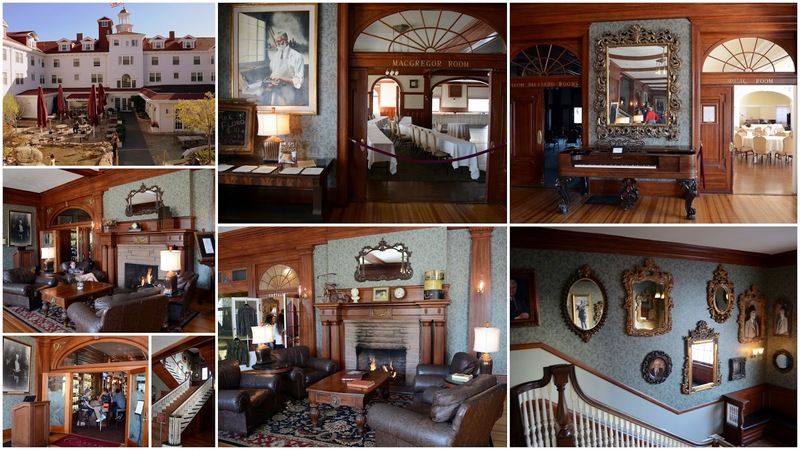 Mille Fiori Favoriti: The Stanley Hotel, Estes Park--America's Most Haunted Hotel? The Stanley Hotel, Estes Park--America's Most Haunted Hotel? As I wrote in my last post, my husband and I celebrated our 40th wedding anniversary in early October. 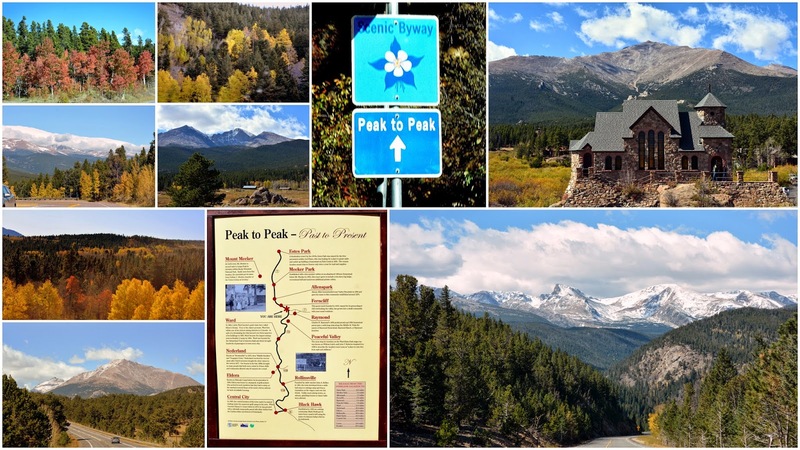 After a special dinner celebration in a local restaurant with our family, we decided to also celebrate by spending a few days in one of our favorite places in Colorado--Estes Park and Rocky Mountain National Park. Estes Park and the surrounding areas were hit hard by flooding last September, when over 14 inches of rain fell on consecutive days, and the rivers swelled and overran their banks with water and mud. Tourism is one of Estes Park's major commodities, and they lost millions because the damaged roads and businesses from the floods halted one of their busiest seasons. They worked hard under the motto "Mountain Strong" to rebuild, and we wanted to support their efforts by spending time there. Estes Park is about 73 miles north from where we live, and to get there we drove the very scenic Peak to Peak Highway. As you can see from the photos above, the views along this road are spectacular! There was still plenty of autumn foliage remaining hat made it even prettier. As we drove into the town of Estes Park we saw the beautiful and historic Stanley Hotel standing on a hill in the distance. We were excited to have a three-night reservation to stay at this hotel, and our excitement grew even stronger when we saw this enormous herd of wild elk grazing on the grass of the hotel's front lawn! 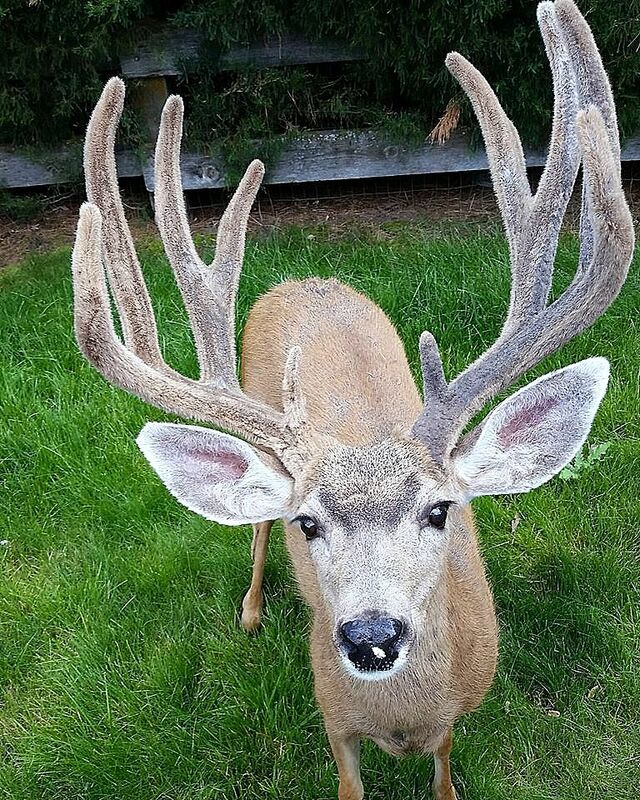 September through October is the "rut season" for elks, where elk bulls gather elk cows and caves into harems and aggressively guard their harems against other bulls. The bull elk for the harem that was in front of the Stanley Hotel this day was very busy herding his many cows to a place under the trees to eat and rest. He kept a close eye on them to keep them from harm. The Stanley Hotel was built in 1909 by F.O. Stanley, the inventor of the Stanley Steamer. He had been sent west by his doctor, a few years earlier, as it was thought that mountain air would improve his health. He did feel better staying in the town of Estes Park and fell in love with the area. He bought land from Lord Dunraven and built his magnificent hotel there--a complex of eleven buildings, some of which are still in use today. The hotel is full of vintage photos, and historical markers. F.O. Stanley can be seen in the collage above in the upper right. As soon as I stepped onto the front porch of the hotel I could see why it is world renown. Its views of the Rocky Mountains are outstanding! Longs Peak has particular prominence in the distance. I took a short movie of the clouds passing over Longs Peak, while I was sitting on the front porch of the hotel, which you can view on my blog's facebook page click here. The main staircase inside the hotel. Views from the back of the hotel, inside the main lobby, special side rooms, and the staircase. Our very comfortable room was on the third floor in the front side section of the hotel and had three windows that looked out at the mountains and the town of Estes Park. That evening we had dinner in the hotel's Cascades Restaurant. Inside the restaurant, there is also a Whiskey Bar and Lounge that offers almost 600 different brands of whiskey! 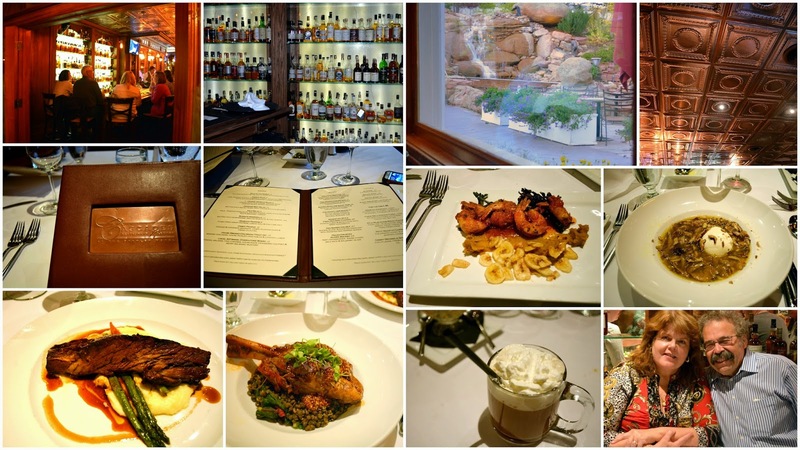 The menu is American steakhouse style, with an emphasis on locally grown Colorado foods. We had a view of the Stanley Hotel's backyard cascades waterfall from our window as we dined. I enjoyed the Crispy Prawns as my appetizer, followed by a Braised Boneless Short Ribs, while my husband had Burrata Mozzarella served in a wild mushroom fino sherry jus, followed by a Colorado Lamb Shank served over wilted Swiss Chard and Lentil Ragout. Afterward, we both enjoyed an Irish Coffee as our dessert. It was a memorable and delicious anniversary dinner! 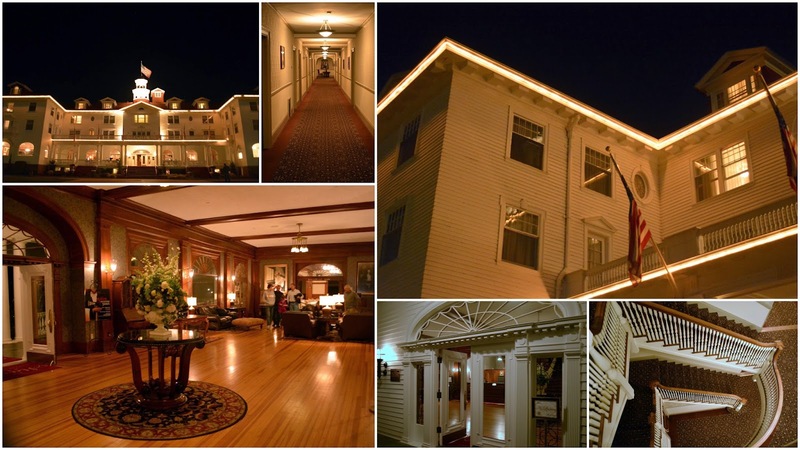 Some views of the Stanley Hotel at night. Our hotel room can be seen on the top right photo. Please click on this collage to enlarge it for easier viewing. 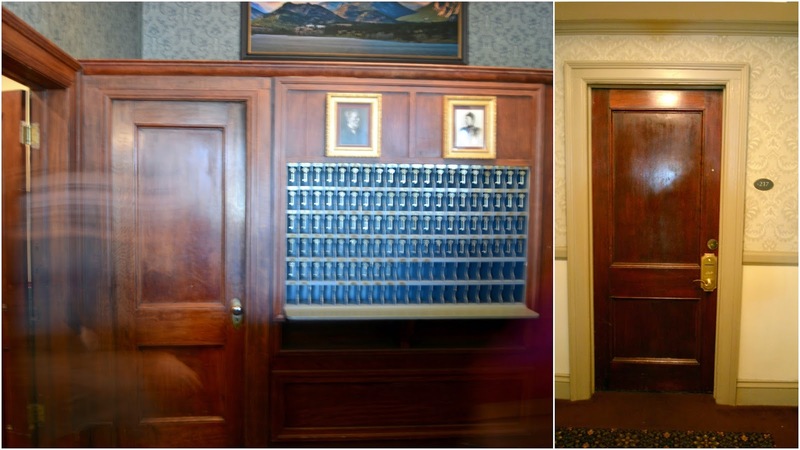 The photo on the left shows the back of the Hotel Stanley's reception desk. When we were checking in I noticed that the old fashioned room keys hanging on the wall grid behind the reception desk began to glow and flash. I wanted to ask the reception clerk if that was a special effect of some sort, but because my husband was conversing with the clerk I did not want to interrupt and took this photo instead. Soon after I took the photo the keys stopped flashing, so I did not mention it to the clerk or my husband. Imagine the chill I had when I finally saw this photo! Do you see the streaky shadow to the left in the photo? If you look closely you can make out a hand......or at least I can see that......do you? The photo on the right is even creepier. My husband and I walked down to see the outside of room 217 --the room that is supposed to be haunted, and the room Stephen King stayed in. I took a photo of the door and thought no more of it. Can you see what I see in the flash reflection on the door? At a quick glance, I see a face! Do you? I can't say I believe in ghosts, but I did think these photos were pretty uncanny! What do you think? Pat, it is a beautiful hotel.. The dinner looks fabulous too. 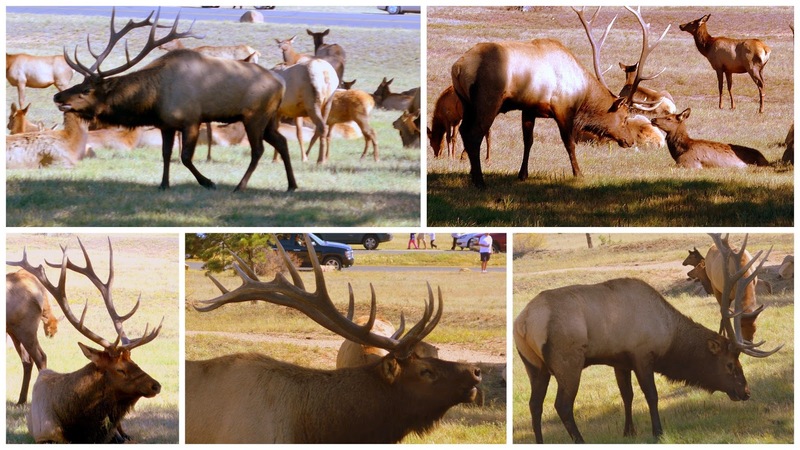 It seems like the elk are all over the town of Estes Park. Thanks for sharing your visit. What a happy anniversary celebration! Enjoy your Sunday and the new week ahead! I would so love to visit this place. Huge King and Shining fan. But the scenery alone is worth visiting. Yep, I can see what you saw....yikes, that means no room 217 for me! I agree with you, The Shining was the scariest book I ever read too. In fact, it scared me so much I've only ever read two other King books and one of those was his book about writing. The hotel and surrounding scenery are beautiful. I'm glad that you and hubby had such a nice anniversary. I read The Shining about a month before our first son was born. At that time, my husband frequently had to go back to the hospital at night. He never knew quite how long he'd be. I was so spooked that I couldn't sleep. So, I took the book and sat in the corner of the bedroom on the floor and read. I do wonder about those two photos!! You have me spooked in broad daylight. Love it! What a beautiful hotel. I bet you had a magnificent celebration. Thanks for sharing your photos. We haven't been to Estes Park in quite a few years. We need to go again. I love this spot and have many memories of this specail place that go back to college. I've stayed at the Stanley also. It is such a fun place. I think my hubby and I need to make a trip up there soon. Well, maybe we will waith until spring now. The snow is probably flying today. Looks like you two have a wonderful anniversary celebration. What a GREAT place... I have heard of that hotel --and would love to stay there sometime. I would love to visit one of the restaurants, but I'd never stay there. I'd have myself so freaked out I wouldn't be able to sleep. A good friend of mine stayed there and had some hair raising stories. I've been to Estes but never inside the Stanley. Indeed I do see the "hand" and "face." 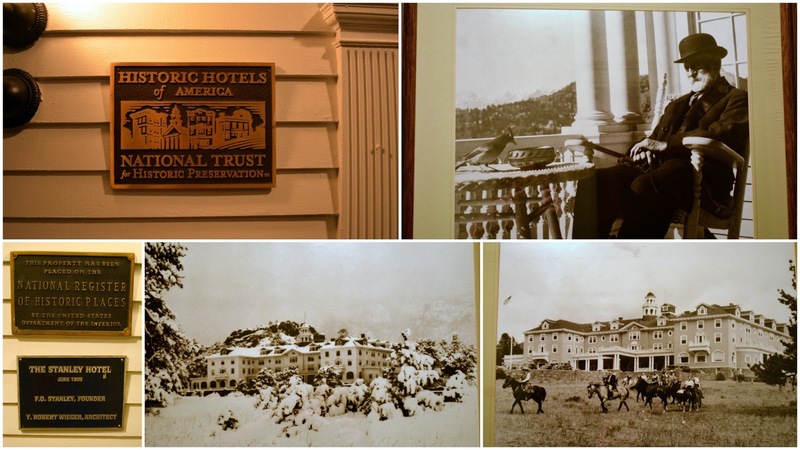 I've had some creepy experiences staying in historic CO hotels. Once, in Glenwood, a ceiling fan turned on in the middle of the night - my friend and I were freezing the rest of the night, but neither of us wanted to turn it off because we thought the other had turned it on. In a hotel in Leadville, the shower woke my husband and I when it started spraying around 2 AM. Loved the tour you gave us, Pat. I do believe. I have never stayed at the Stanley, but my husband has. We always talk about staying there for an anniversary. Our 40th is next week. It is very good to see Estes as a destination because of the flooding last year. The merchants there and in the surrounding area need business. Another great Colorado post. I saw this hotel featured in Discovery channel and I was already mesmerize by it. It indeed very beautiful I would not forget to take a note of this one. And yes I think you just captured something in there. Thanks for sharing. I forgot the most important thing. HAPPY 4oth wedding anniversary! Happy anniversary! The Stanley Hotel is beautiful and quite impressive! That is quite a heard of elk! Oh my, your ghost pics really freaked me out!At first, I thought you took this for a laugh and asked husband to move quickly in front of camera and play the role of ghost :) But if there was no one in sight when you took these, it is pretty spooky when you ask me! The view is spectacular though! What a beautiful place to stay to celebrate such a special event. The hotel looks like a lovely place, and the scenery just can't be beat. What a grand hotel to stay in! Looks like another fun adventure. Hope your anniversary was special and fun. Oh gosh, beautiful scenery and a lovely hotel. Beautiful photos :) What a lovely hotel and the scenery so perfect! Hello, I clicked your link at Amaze me Monday because I recognized the hotel. I've spent wonderful time at Estes Park and have the best memories. We've seen the hotel from a distance, but never stopped. We were there camping from Texas. I enjoyed seeing the place through your blog. I would love for you to visit mine as well. Have a great day. What a fantastic post! That huge hotel, seemingly out in the middle of nowhere. And all those elk. Wow! What a treat! What a memorable anniversary trip! Thanks for sharing it. I did not see what you saw, but then again, I've never believed in ghosts. Estes Park looks so beautiful, we've never been to that area. The Hotel looks fabulous, the restaurants and your room was so beautiful. I DO see the face on the door--that is toooooo creepy for me. I do see a hand but the door is more vivid. Wonderful collages. It's so nice to see this amazing hotel up close and inside. You did a good job of presenting and telling about it. Happy 40th! Amazing post. Filled with so many gorgeous views. The Elk are awesome. The hotel looked fabulous even if it (may or may not be haunted) - Your last photos were certainly interesting. I've never read the Shining nor seen the movie, I don't like scary things. I have seen many ghost hunters exploring this hotel and the Stephen King story so I consider you brave to stay there...and yes I see the face and hand....I don't think I could stay there and sleep....great pictures. Well, I lived in Colorado as you know by now, and took trips VERY often to Estes Park. Quite a few times we dined in Stanley Hotel. And I've know workers that will vouch for it being haunted. Oh the stories they can tell. What a beautiful place to spend your anniversary. Those photos area bit spooky! That will be an anniversary you never forget. What a beautiful place, and ghosts on top of that! Hi Pat, On our trip out West we saw the Hotel but did not take the time to go inside. I'm sorry we didn't now. 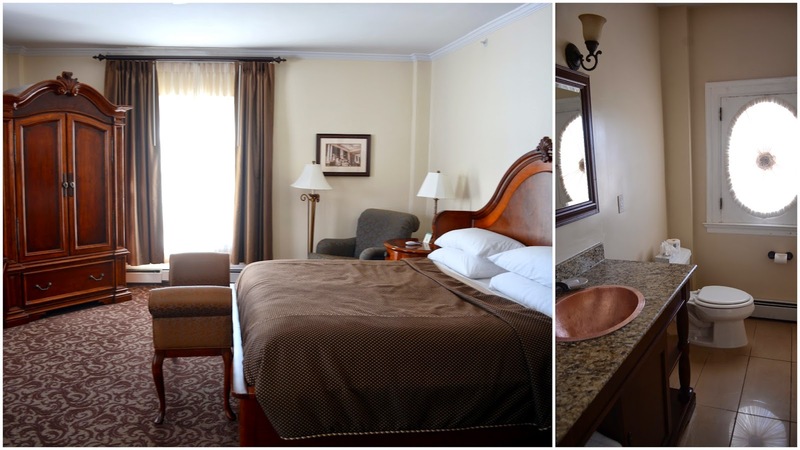 Your photos of the keys and room 217 are definitely something to ponder. I do not believe in ghosts either. But.....HA! Your room was lovely and the food looks delicious. A wonderful anniversary celebration. We have seen lots of Elk out West but we were not there for the 'rut season. 'We were there when the little ones were nursing. A delightful scene. We have elk in the Smokey Mountains now. They are kind of on a reserve and protected. The herd as grown quite large. I was so excited to see this post because a good friend of mine just stayed at the Stanley and sent me photos. I visited there over 20 years ago and loved it. I had read the book earlier and pictured the lobby exactly as it appears in person. 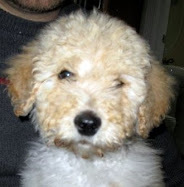 Thanks for a great post - I'm sending this link to my friend John right away! I have enjoyed visiting this lovely state several times. However, never saw this hotel. Glad you were able to enjoy the luxury of it. Gorgeous photography ~ hard to pick a favorite ~ Lovely! 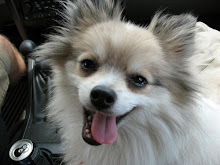 artmusedog and carol (A Creative Harbor) ~ Happy Week to you! 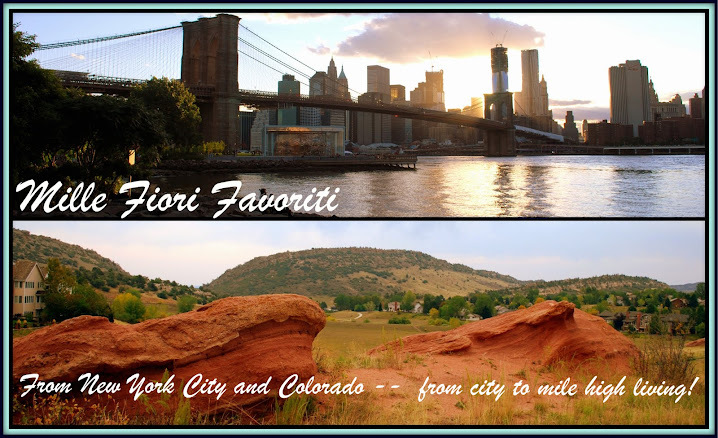 Thanks for visiting our beautiful town and writing about it! I loved your post. My family and I just moved to Estes Park after living 17 years in Colorado Springs. We joke that we got tired of paying the gas money. I've been to the Stanley a dozen times and it never disappoints. Our son actually just got his senior pictures taken there. Next time your in town we will have to grab coffee and talk blogging. Wonderful place. Haunted or not it looks great. Well I enjoyed the elk and views inside but then we got to the part about The Shining and that hotel! Oh yes that book was scary. What a great place to go for your anniversary. The scenery is breathtaking and the hotel a greta place to stay. Pat the minute I saw this place I could hear, "Here's Johnnie". I did see the hand, I owned a haunted Hotel in NC. The next owner had same experience. Great Post and it's so nice you both have these adventures. 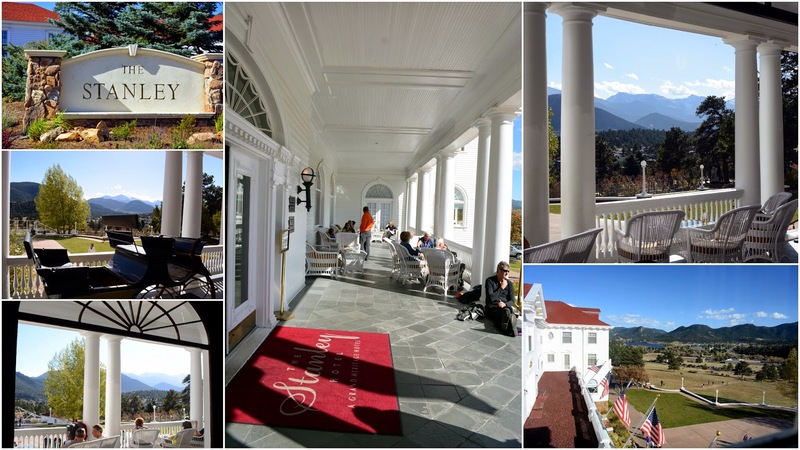 What a beautiful place to spend your anniversary...both Estes Park and the Stanley Hotel! And how amazing to have a herd of elk there for the occasion. We toured the Stanley on our visit but you had the 'real tour'...spending several nights there. And you have a way of documenting everything so well right here! Downloading those pictures would have certainly frightened me! I do believe! The hotel and the views are spectacular, I would love to go there. The Shining was absolutely one of the scariest books I have ever read (numerous times). I am curious -- were there hedge animals?! Great post Pat. Love all the pictures. Your hotel is outstanding and I like the elk. Happy Anniversary! What a fascinating and beautiful place. And those elks are the final magical touch! Wow Pat, what an amazing historical hotel and a very special place to celebrate your anniversary! I really enjoyed all your photos! 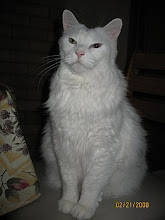 I was peeking at midnight last night, and as I read about and viewed the spooky photos they sent shivers down my spine!! I don't read Stephen King much, too scary for me! I can definitely see the hand and the face like you did!! I am not sure I would of slept at all above room 217! Great post! Margaret from B.C. Hello Pat, stopping back to say Thank you for linking up and sharing your post.I love the elk photos. Have a happy weekend! Oh my goodness!!! On our July trip we were able to drive by the hotel and get a couple of pictures from the road, but didn't get to go inside. First of all, the elk on the lawn--awesome! I so wished we'd been able to see wild elk up close but it was just the wrong timing for us. Secondly, your interior photos were so fun to see...but oh my gosh! Those two photos, particularly the one on the left, are so scary! I HAVE to show this post to my daughter. It will freak her out. Congrats on the anniversary! When I saw your hotel, I thought I had just seen it on TV with Don Wildman (we get old US shows here in NZ but I still find them interesting)! I'm still wondering why the keys were flashing! What a wonderful trip, fantastic hotel and fabulous scenery. Congrats on 40 years together. Have a good week. Congratulations on your 40th anniversary. What a beautiful place you chose to spend it in. How wonderful to see the large herd of magnificent elk there. The haunted history of the hotel is fascinating. I do see a presence in your photos! 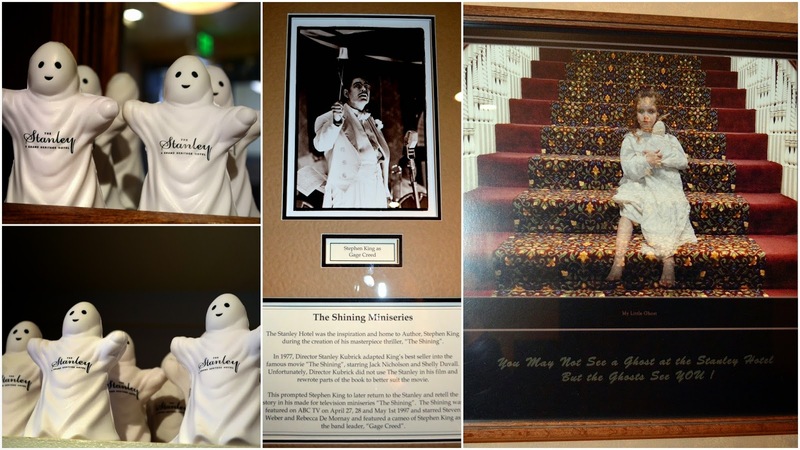 Paul and I visited the Stanley Hotel in August and had lunch there. I toured through and thoroughly enjoyed its history. I think it's easy to believe in ghosts in certain parts of the hotel but found it more beautiful than scary. I would love to stay there sometime! Maybe for our 40th> (which is a ways away - you two were children.) You do know how to celebrate!